The findings are detailed in the paper "Discovery of a Makemakean Moon," published in the June 27 issue of Astrophysical Journal Letters. "Makemake's moon proves that there are still wild things waiting to be discovered, even in places people have already looked," said Dr. Alex Parker, lead author of the paper and the SwRI astronomer credited with discovering the satellite. Parker spotted a faint point of light close to the dwarf planet using data from Hubble's Wide Field Camera 3. 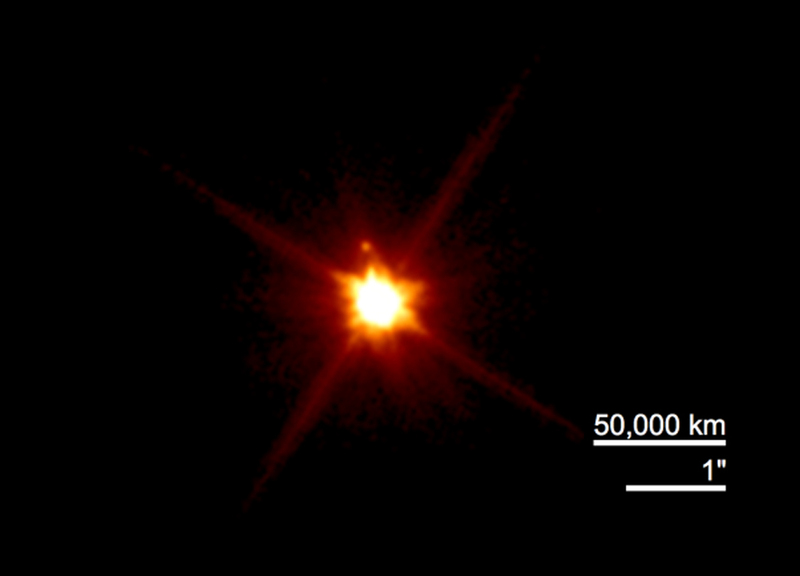 "Makemake's moon -- nicknamed MK2 -- is very dark, 1,300 times fainter than the dwarf planet." "With a moon, we can calculate Makemake's mass and density," Parker said. "We can contrast the orbits and properties of the parent dwarf and its moon, to understand the origin and history of the system. We can compare Makemake and its moon to other systems, and broaden our understanding of the processes that shaped the evolution of our solar system." With the discovery of MK2, all four of the currently designated dwarf planets are known to host one or more satellites. The fact that Makemake's satellite went unseen despite previous searches suggests that other large KBOs may host hidden moons. Prior to this discovery, the lack of a satellite for Makemake suggested that it had escaped a past giant impact. Now, scientists will be looking at its density to determine if it was formed by a giant collision or if it was grabbed by the parent dwarf's gravity. The apparent ubiquity of moons orbiting KBO dwarf planets supports the idea that giant collisions are a near-universal fixture in the histories of these distant worlds. The authors of this paper were supported by a grant from Space Telescope Science Institute (STScI), which conducts Hubble Space Telescope operations. The Association of Universities for Research in Astronomy Inc. in Washington, D.C., operates STScI for NASA. The Hubble telescope is a project of international cooperation between NASA and European Space Agency. NASA's Goddard Space Flight Center in Greenbelt, Md., manages the telescope. A Southwest Research Institute-led team has discovered an elusive, dark moon orbiting Makemake, one of the \"big four\" dwarf planets populating the Kuiper Belt region at the edge of our solar system.